Big Wheel Building: For L.
The Missus is a longtime rider that would prefer to be on her mountain bike as much as possible. She also road rides when it's too hot or wet to be out on the trails, but make no mistake that dirt is where she'd prefer to roll. A shoulder injury a few years ago went misdiagnosed and untreated, with the unfortunate result that it deteriorated significantly before she had a grasp on what she was up against. Therapy and time seem to be working, albeit very slowly. 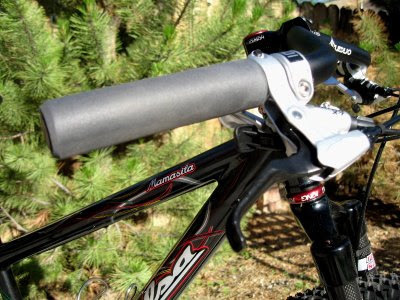 MTB riding not only hurts the shoulder as she rides, it increases the potential for crashing and reinjury. So MTB time has been limited and in the spring with tacky dirt, brilliant temps and stunning flowers that's a hard pill to swallow. It wasn't difficult to notice her increasing frustration as the spring progressed and her ability to ride did not. We don't have many dirt roads around these parts that are accessible for day-rides, but there are just a few that lead to (and up out of) remote-ish corners of the valley. When I suggested 'sploring dirt and paved roads instead of pining for the trails she couldn't ride or duplicating road loops that she's done hundreds of times, her eyes lit up and she thought it was a great idea. While she certainly *could* ride her FS bike on loops like this the fatty fat tires, steep-dirt gearing and double squish action are far from ideal. 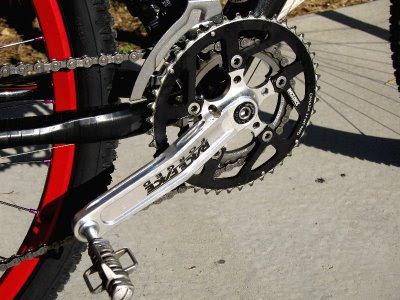 Likewise with her SS--geared for dirt and she's not enough of a techhead to want to swap gears or wheels before a ride. And since her road bike is limited to ~23mm tires we had a bit of a conundrum: What bike? That question mark didn't hover for long. I always seem to have a pile o' componentry laying around looking for a chassis to hang on, so the legwork on this one revolved around finding the appropriate chassis. Herself's 5'4" height limited options considerably, so in relatively short order the frame list was down to 3. Of those, the Mamasita won out for various reasons like fit, cost, purported comfort, and somewhere in the middle of the list was the paint. I was pretty sure she'd like it. 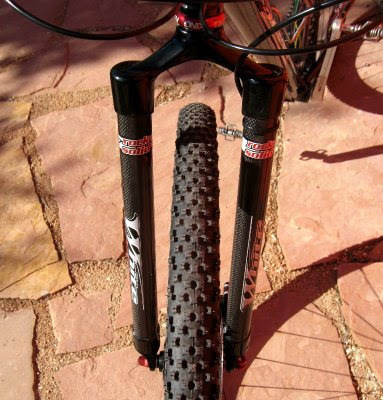 Suspension was considered but it seemed needlessly heavy for the way and places this bike will be ridden. There is a veritable plethora of rigid forks to choose from and when comparing the numbers it doesn't take long for your head to spin. 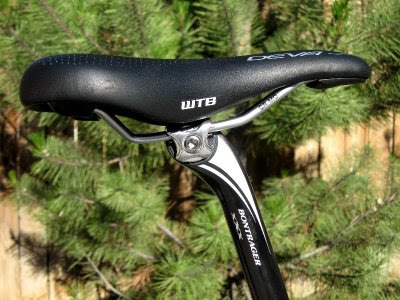 I chose the local guys' product for many reasons, not least of which is that I've ridden and liked it myself. 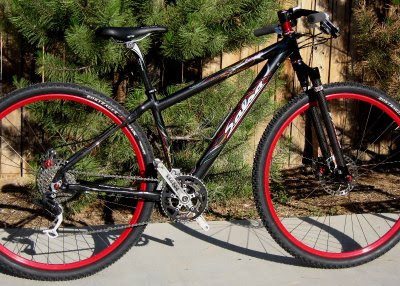 Since the drop bars on her roadie tend to tweak her shoulder on long-ish rides, and the flat bars of the MTB don't offer many options when cruising, I knew that she would want something a little different. I asked her a few questions and we mocked up a few hand positions, then I went looking. Closest thing I could find to what I *thought* would work is this bar by Origin 8. 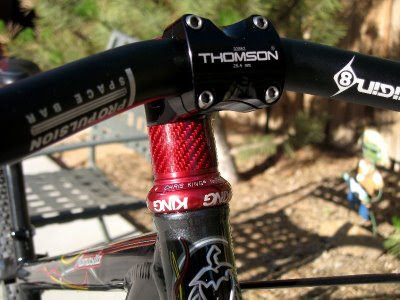 My last pair of 170 square taper cranks were bolted onto a Phil Wood BB that had languished on a shelf far too long. 30 x 44 gearing up front paired with an 11/34 out back allow her to get up any grade she'd care to see on this bike, and don't slow her down a bit when hauling the mail on tarmac with a tailwind. 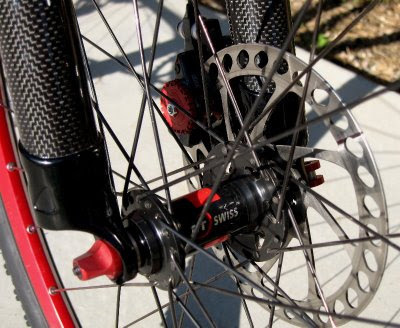 Favorite hubs ever laced 3x with triple butted spokes and alloy nips. Color was optional but these rims had been hanging around unclaimed for almost a year and they seemed to 'match' the motif of the rest of the bike so I didn't hesitate. Finished 'em off with some 44mm do-all tires. A comfy perch atop a buzz-killing post sealed the deal. She's only been out on a few rides but the unhideable grin and bubbling verbal feedback tell most of the story. 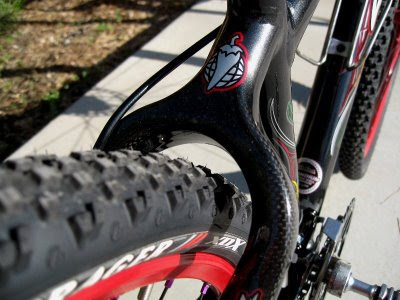 Tires are likely to change as the bike and rider settle into a niche, and the bars could potentially be upgraded to something custom if these aren't quite the solution needed. Other than that it seems to have opened up many options for her and I'm betting it'll continue to get ridden even after shoulder rehab is complete. Interesting process MC. You could add a bike consulting service to your biz in a heartbeat. Beautiful ride! Especially nice considering it was made from leftover parts. Wish my parts bin looked like that. More on the custome builder if you want from me not so publicly. What's the deal with the upside down King HS? Did you just reverse the cups and it works with the race and top plate?